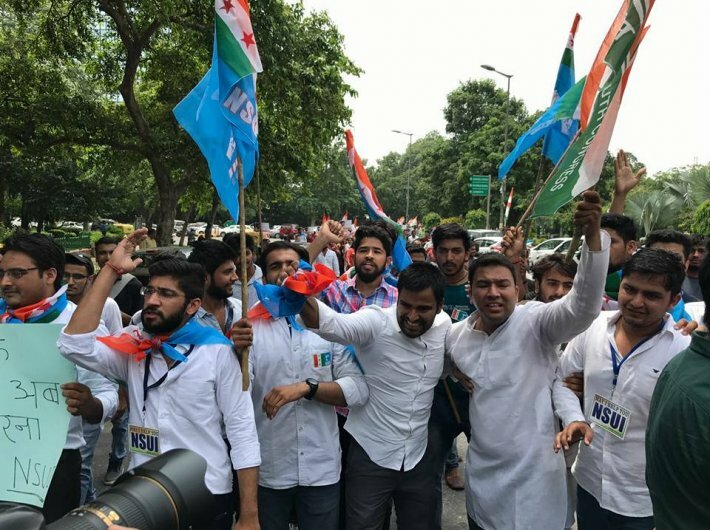 The Congress party’s student wing, the National Students Union of India (NSUI), has made a stunning comeback in the Delhi University Students’ Union election, walking away with two top positions. NSUI’s Rocky Tuseed won the president’s post, while Kunal Sehrawat bagged the vice president’s position. ABVP won the joint secretary’s and the secretary’s post. The votes were counted on Wednesday. The NSUI has emerged victorious in the premier university's student body after five years. All this while the Akhil Bharatiya Vidyarthi Parishad, affiliated with the BJP, had been ruling the roost. Minutes after the results were declared, NSUI tweeted: “A major comeback for us in #DUSU2017, students of DU have given us a huge responsibility to fight for their rights.” “Finally this victory belongs to every NSUI activist who have worked tirelessly in DU,” it said in another tweet. NSUI activists were ecstatic with the win and broke into a dance after the results were out. DUSU, with its humongous number of voters, is often considered an indicator of political winds in the capital. Meanwhile, earlier this week, at Jawaharlal Nehru University (JNU), the left parties retained power in the student elections while ABVP came a second. NSUI garnered less votes than even 'nota' (none of the above).